There's a glorious pulp fiction feel to this collection from BY Yan. From the covers, through the monthly publication in that old-fashioned magazine style, the design and feel of The Lynchman's Owl is right up there with the classic old serial movies of years gone by. 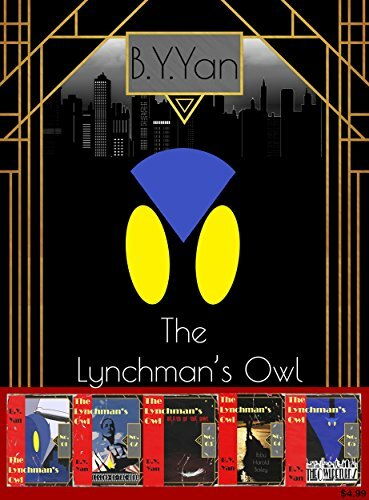 This anthology brings together several short stories investigating the legend of the Lynchman's Owl, a figure from years gone by whose shadow still falls across the murky criminal underworld two decades on. The obsessed investigator Bailey is determined to get to the truth of who the Lynchman's Owl really is, his path mirrored by fellow snooper Madine, who discovers different facets of the owl's identity in her own probe. Is the Lynchman's Owl a single man? Is he a legion of different individuals, each adopting his legend for their own purposes? The set-up is intriguing. However... and I wish there wasn't a however... the writing lets the premise down. I don't know if it is deliberate choices that don't fit with me, or if the monthly schedule has prevented any meaningful editing, but it is incredibly hard going to get through the book. There's a dense forest of sub-clauses, filled with dangling commas, more than a few of which are ripe for the plucking. An over-reliance on spellcheck rather than proper line editing also leads to some errors, such as bought being used instead of bout. It leaves you puzzling as you try to figure out what sentences are trying to say, and that takes away from the flow. While the rest of the package has the air of a two-fisted pulp thriller, the writing is far removed from the short, sharp, quick-punching style you might expect to go with that. I'd love to love this, but in the end, I really had to push myself to get to the finish. For those who do enjoy it, there's a cool bonus at the end - the first five chapters of BY Yan's fantasy novel. If you get on well with the author's style, that's a hefty preview of his other work. For me, though, I just couldn't handle having to untangle the plot from a fistful of convoluted sentences.